Classic Grilles aluminum vents are all hand made with a 1/4" thick faceplate. These Art Deco style registers are a modern alternative to replacing metal registers which rust over time. Choose your aluminum vents in either a painted white, brown or black finish, or leave it bare for a chrome look! If the Art Deco style register is left bare, a clear coat will be applied to protect the faceplate. Aluminum vents are paintable if you request that no clear coat be applied to the unit. Install these Art Deco style diffusers onto your wall or ceiling easily by screwing them into place. Screws are included with every order. This aluminum vent is sand cast here in the US and is perfect to use in bathrooms or rooms with high humidity. The Art Deco style faceplate has a steel damper attached to it, allowing you complete airflow control. 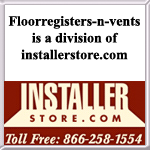 Tip: Order the aluminum vents according to the duct opening measurement in your wall. The 10 x 10 Art Deco style registers will fit into an opening of that size. The overall faceplate will be 2" to 2 1/2" larger on the width (first number) and 3" to 3 1/2" larger on the height side (second number). Sizes can vary since they are hand made. Important: Lead time for aluminum vents are between 7 to 9 weeks after an order has been placed. The Art Deco style registers are special ordered, non returnable items that cannot be canceled once order is placed. Select the aluminum vent air return, which is made with a screen backing, for your cold air needs. Classic Grilles offers decorative registers in more than just one design. Order these Art Deco style registers now to create a new look and feel to your home.